Using network science to explain the where, why and how. Scrolling through the Twitter feed even before opening the window blinds. Sharing photos of today’s breakfast on Instagram. Sending happy birthday stickers to friends on Facebook. Emailing colleagues and setting up calls through Skype. Getting home with Uber and ordering dinner with Deliveroo. The digital world is filled with interactions between individuals and among users and companies. Researchers have long tried to explain human behaviour using the traces our steps leave in the digital space . Those working in the field of network science represent our digital interactions as networks with distinct entities called nodes which are connected with an edge if they are somehow related. The digital traces we leave behind are stored in massive databases, harnessed by the online places where we spend our clicks. Here, I discuss how the corners of the World Wide Web that gather most of our clicks came to be at its centre, what the impact on the digital economy might be and why policy makers should use new tools from network science to track economic development and implement new policies. In 1959 Erdos and Renyi formulated two models that generate random graphs , meaning that every new item has an equal probability to connect with any node on an existing graph. Decades later, Barabasi and Albert came up with a different structure, the scale-free network, which could explain how real networks, such as biological ecosystems, are formed . They showed that scale-free networks add nodes using a preferential attachment mechanism which describes our tendency to connect with nodes that already have a high connectivity. In 1999, Bianconi and Barabasi showed that there is also another mechanism at play, fitness, which describes the inherent competitive factor a node may have, enabling latecomers in a network to acquire links at a faster rate than the older nodes. Let’s demystify these processes with an example. Suppose there are two kinds of nodes, social networking platforms and users. Now draw a link between every user and the platform a person is using. Preferential attachment indicates that there is a high probability for a new user to connect with the most popular social network, meaning the one that already has the most users. To explain fitness, suppose that a new platform enters the network and provides some novel, very appealing features. This new entry will attract new users even without having as large installed user base as its established competitors. Due to these processes, new entrants are not connected to existing nodes uniformly, but in a way that older nodes with some desirable characteristics are preferred. As Barabasi and his colleagues showed, the degree distribution in scale-free networks follows a power law, meaning that there are a few nodes, also called hubs, that are connected with a significant proportion of the total nodes, while the rest of them acquire only a few links. Figure 1. 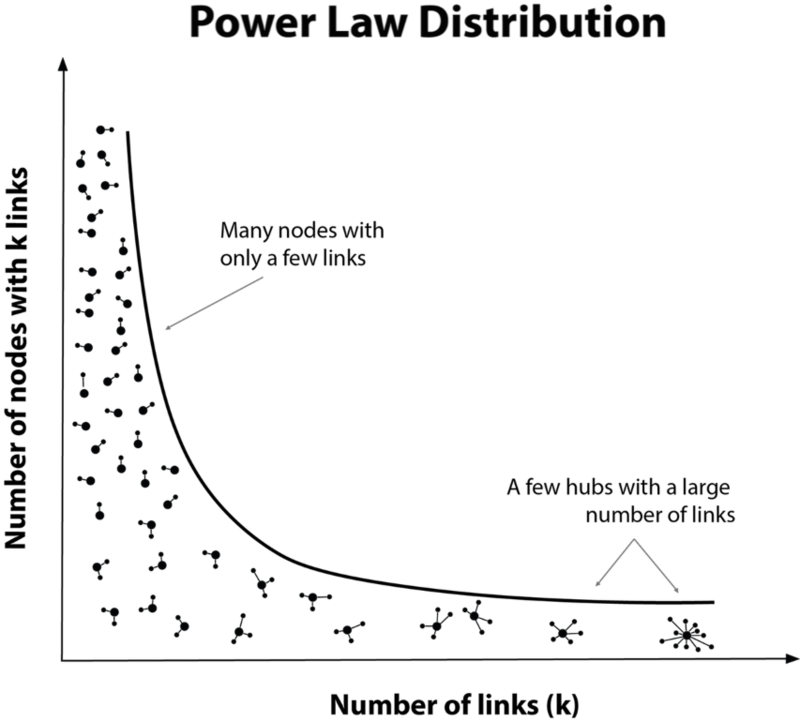 Power law degree distribution of scale-free networks. By empirically studying the structure of the World Wide Web, Barabasi and his colleagues showed that it is a scale-free network. Today, its main hubs are the online locations we visit on a daily basis such as Google, Facebook, Amazon and Uber. All of the above companies are platforms but their business models vary. Google and Facebook are advertising platforms specialising in targeted ads but using different mechanisms for it, while Uber is a lean, asset-less platform. Amazon, best known as an e-commerce giant, also has activities expanding in cloud computing, brick and mortar stores, artificial intelligence and crowdsourcing marketplaces. What makes these platforms stand out of the competition and be central hubs in a network of almost two billion nodes is their ability to transform our interactions with them into the most valuable resource of the information age; Data. By providing a seemingly free product or giving access to a marketplace with an abundance of choices, these platforms collect our data to increase their fitness by optimising their algorithms and offering better services. The improved services attract more users which leads to an increased data generation and thus, even more users. The mechanisms of scale-free networks can be observed here. Due to network effects, popular platforms attract more users, while their large user base improves their services and therefore, increases their fitness. After connecting to a platform, its goal is to increase the time we spend on it in order to generate even more data which could be seen as increasing the edge weight between a user and a platform. However, this has some implications. Our attention span is a limited resource and has to be shared across platforms that satisfy different needs. This leads to companies that seemingly work on different markets converge and compete on multiple fronts due to their hunger for additional links. Google and Uber are developing self-driving cars, Amazon and Google offer cloud computing services, home assistants and other kinds of hardware. All of them compete on artificial intelligence innovations. This competition might be beneficial in the short term, providing a variety of products and improved services to the users, however, the long term impact could be worrisome. Instead of having a whole, densely connected network of users and platforms, users might start spending increasingly more time on a single platform that satisfies the majority of their needs, drop most of their connections to other platforms and consume content and services of a single provider. Consequently, the World Wide Web is slowly transformed from a web for rich interactions and on everything to a series of walled gardens that prevents us from spotting alternatives and dramatically increases the cost of reconnecting to other platforms. Fragmentation might be the long term consequence of the short term gains. But how does it affect digital economy? We can use network science and the properties of scale-free networks to examine how the existence of hubs might affect the digital economy. In the 1960s, Paul Baran was hired by the RAND corporation  to create a communication system that could survive a nuclear attack. While reviewing the communication networks of his time, Baran discovered the topological vulnerabilities of the existing systems and proposed one that could sustain a devastating attack. Figure 2. Possible structures of the Internet according to Paul Baran. Initially, Baran identified networks with a centralised architecture (Figure 2, A). These graphs have a starlike topology and a single point of failure, meaning that the destruction of the central node will make the network collapse. Fortunately, the structure of our digital economy is different. Baran also found systems that are decentralised, meaning that there is a hierarchical structure of stars that are connected to each other (Figure 2, B). Our digital economy, with its central hubs and smaller platforms resembles that. At first glance, living in an economy with this network architecture seems fine and in many cases it actually is. Assuming that various attacks such as economic disasters and bankruptcies occur at random, networks with hubs are exceptionally robust against catastrophic failures. The reason behind this is that the probability of removing a big hub is quite low due to their small number and therefore, the chance of fragmenting the digital economy network is negligible. The hubs are the strength of scale-free networks and have the power to hold the different communities together. However, not all attacks are random. In the case of targeted attacks on hubs, the network falls apart in a short time. This might seem rare but the financial market meltdown in 2008 and the bankruptcy of some of the largest hubs that led to a breakdown of the economy  showcases the devastating effects this might have. Living in a non robust economy where the removal of a few key players brings down the network could create long-term challenges. Apart from the fragile structure of the distributed economy (Figure 2, B), there are some other caveats related to the node fitness and data acquisition. 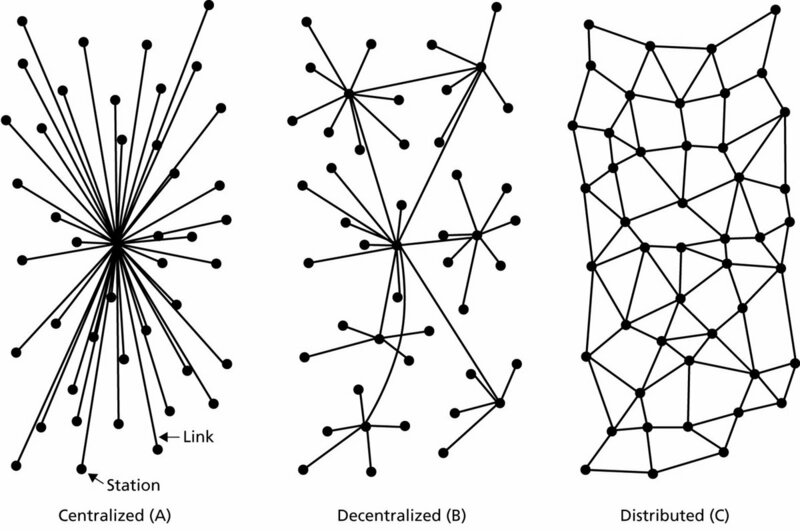 Networks with such an intense “rich gets richer” nature are not friendly places for new nodes that would like to increase their links, take a central position in the network and compete with the main hubs. This has a negative impact on innovation. New entrants in the network are either bought, making them disappear from the graph, or get starved from the much wanted for their survival links that generate data and revenue. 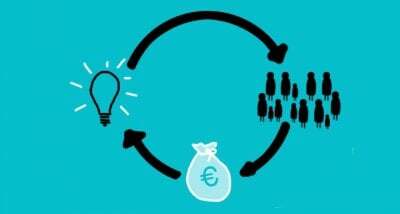 As a result, new ideas are not created, or if they do, they originate from pre-existing hubs. How can we use network analysis in policy making? Networks can potentially provide a much richer picture of an economy. 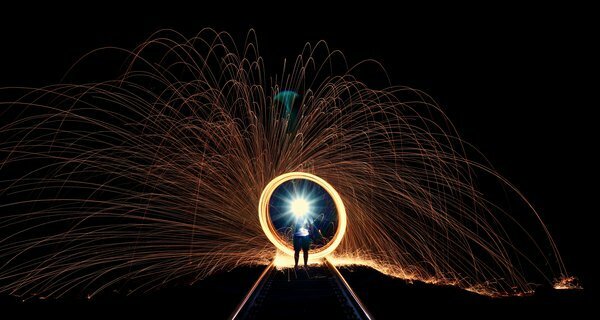 Indicators are useful, but if policy makers want to drill a bit deeper and get a better understanding of an economy’s inner workings, using networks could be the way forward. The ability to concentrate on and engage with individual nodes, platforms and potential challengers, could provide valuable insights on the reasons of their success or failure. Networks could also be used to create indicators that would measure the probability of a node to become a hub. Graph embeddings, a set of machine learning techniques that finds the vector representation of nodes, could help us identify hubs in two ways. Firstly, we can use the node vectors to predict the number of links that a node might acquire and determine if it will become a hub in the future. Secondly, we can spot hubs based on their position on the network. Given a list of platforms, we can find other nodes on the graph that have a similar vector representation. Centrality or node influence metrics could be used to strengthen our antitrust laws. For example, we can examine how the removal of a node and the additional links that a hub will get might change the network structure and decide if the acquisition should happen. These metrics are also complementary to the idea of using the amount of data a company holds to decide if an acquisition should get the green light. More links lead to more data, more data increase a hub’s fitness and thus, it attracts more links. Baran proposed in the 1960s that the Internet should be designed to have a mesh-like, distributed architecture (Figure 2, C), redundant enough that it would survive a nuclear attack, even if many of each nodes went down. Nowadays, the fear of a nuclear attack is not as prominent but the growing importance of hubs in our digital economy and the catastrophic effects their failure might have should be a major concern and a drive to search for new ways of spotting them. Using network science to understand the topology of the economy is a prerequisite for designing tools and implementing policies that make the system adapt fast and in reliable ways to failures. Thanks to John Davies and Juan Mateos-Garcia for their comments and thoughts on this blogpost! Barabási, A.L., 2010. Bursts: the hidden patterns behind everything we do, from your e-mail to bloody crusades. Penguin. Erdös, P. and Rényi, A., 1959. On random graphs, I. Publicationes Mathematicae (Debrecen), 6, pp.290-297. Barabási, A.L. and Albert, R., 1999. Emergence of scaling in random networks. science, 286(5439), pp.509-512. Barabasi, A.L., 2003. Linked: How everything is connected to everything else and what it means. Buldyrev, S.V., Parshani, R., Paul, G., Stanley, H.E. and Havlin, S., 2010. Catastrophic cascade of failures in interdependent networks. Nature, 464(7291), p.1025.